It's 2016, and we still don't have teleports, flying cars, or holograms – but we will get there. 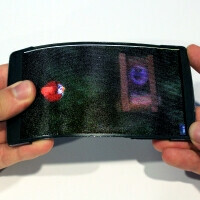 Check this out – researchers at Queen's University have created a holographic, flexible smartphone! Now, hold your horses, for the HoloFlex phone's display only shows a 160 x 104 resolution image, meaning the graphics are about as dazzling as those from old 3D postcards. But still, the holographic part that lets you check out a 3D object from all angles by rotating the phone is totally there! The effect is accomplished by combining a flexible OLED touchscreen display with a microlens array made up of over 16,000 tiny fisheye lenses. Images are rendered into 12-pixel wide circular blocks that project the full view of a 3D object from a particular viewpoint. This is the kind of innovation that offers very intriguing possibilities. That's how the hologram part is taken care of, but what about the flexible smartphone thing? To make that happen, the researchers implemented a special sensor to make bending the phone correspond with the movement of objects along the screen's z-axis. Given that and the complex rendering involved, it's understandable why the HoloFlex employs the Snapdragon 810 chipset with the Adreno 430 GPU for horsepower. What else is this display good for, besides playing holographic Angry Birds and viewing teapot models in 3D? Research director Dr. Roel Vertegaal proposed that the addition of a depth camera will let users perform holographic video conferences. Right on the money! According to the doc, “users literally pop out of the screen and even look around each other, with their faces rendered correctly from any angle.” Hopefully, this is the kind of innovation that big-shots like Apple and Samsung have in store for the next couple of years. If anything can make smartphones truly exciting again, it has to be holographic video calls! Nahh I'm still waiting for teleportation.. and also Good Luck having a smartphone with hologram and Oven functionality. Where is the S810 joke? Am still waiting for the flexible/bendable phone. I am a bit disappointed that Samsung hasn't outed one yet. it's nearly 3 years since they showed a flexible care prototype. It's got to a Samsung. If they won't, nobody will. And it's not like they are averse to introducing something radical & testing it's practicality & response. The first Note was a big risk on their part at the time. Only Samsung has the technology, the $$$ to develop it & the balls to make a risky launch.